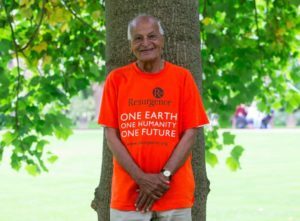 When our original project founders, Nigel and Margaret Woodward, met with the well-known activist Satish Kumar, a spark of inspiration was shared from which the Network of Wellbeing (NOW) was officially born. Nigel and Margaret felt that the concept of wellbeing offered something valuable, an idea which could positively influence policies and lifestyles, helping to ensure we live more sustainably within our planet’s natural limits. Satish shared their vision and endorsed it by becoming a NOW Trustee. At the end of 2012, NOW formally started operations, hiring the first members of our team, and we have been building up our work ever since. If you feel inspired, please check out all of the ways you can get involved!